Welcome to my 2014 Primitive Valentines Collection. A Warm Welcome to you and thanks so much for stopping by. A very Happy New Year to you all, I hope this New Year brings good health, joy and warm memories. Up for sale today is this sweet 23" inch Primitive Valentine Greeter Doll just perfect for bringing in the New Year with Love! This Prim Doll is sewn from a lightly grunged muslin, her head has a pinched stitched nose and brows, floss eyes, cream wool hair and painted lips. Her dress is a polka dotted flannel with a striped apron tied on. 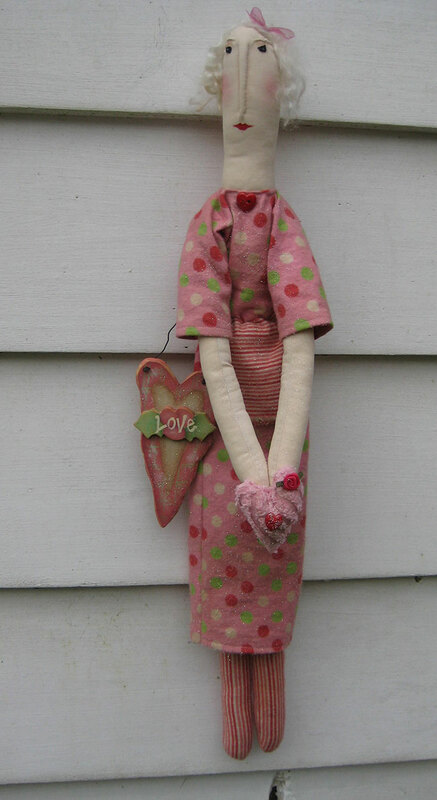 She's holding a little pink chenille fabric heart and a painted wood heart. I added a ribbon loop on the back for easy hanging and sprinkled lightly with glitter to give a bit of sparkle. This lovely Prim doll will arrive at your home, signed and wrapped with care. Hang this Valentine Dolly on your Front Door to greet your family and friends or above your mantle to be enjoyed throughout the cold winter months and Valentine season. This is a Howling Hag Original and will come to you signed and dated. Thanks for looking and be sure to check back often as I add new items regularly.